We've had fun in Kuching, exploring the old part of town with our friends on Vamp and eating delicious curry meals at some of the many excellent restaurants. We've even got a favorite coffee shop where they serve yum-licious hot or cold Borneo coffee for less than $2 for a fancy iced latte. Sue's kind of place! We had a lovely second visit to the orangutans at Semenggoh Nature Reserve on Rachel's 22nd birthday. It's fruiting time, which means the semi-wild orangutans are less likely to appear at the feeding stations, but we were lucky to have Delima (aka Hot Mama) and baby on the walkway just 10' (3m) away, hanging gracefully by one long, muscled arm from an overhead tree while she ate bananas. Her baby climbed all over her, using mom as a jungle gym, snatching bananas from her, then hanging upside down to smile at all of us with our cameras. They are so amazing! 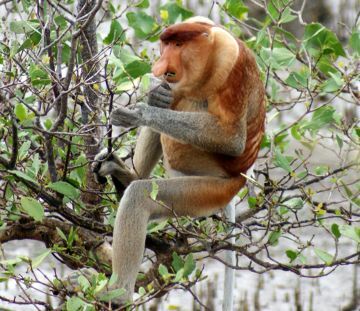 Alpha Male Proboscis Monkey. Yummy mangrove! 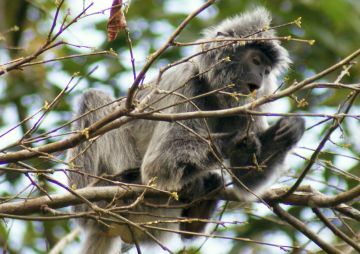 While Jon finished off some boat chores, Sue visited Bako National Park with Rachel and had some fun encounters with troops of Silver Langurs, eating all the new leaves they could reach. They also found a troop of Proboscis Monkeys and spent half an hour watching the alpha male with his huge, pendulous red nose bobbing up and down as he scraped leaves from the mangrove branches while the younger monkeys played all around him, also searching for the perfect breakfast leaves. 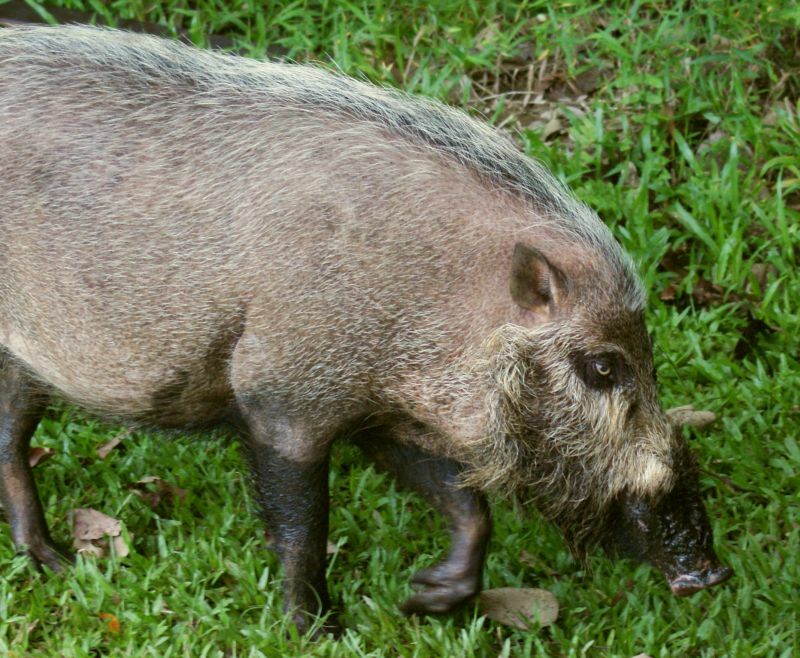 Back at headquarters Sue came face to face with one of creation's ugliest land creatures: the Borneo bearded pig. It liked to rummage in the mud with its almost meter-long snout, covered in a thick brown mop of bristles that all but hid his piggy little eyes. Borneo's bearded pig. Need a shave, mate? On Sunday we dropped our lines at the tiny Kuching Marina and were promptly shot down the river by the strong currents associated with the full moon and spring tides. The marina is 7 miles up the Sarawak River so we had lots of fun watching the various marine activities on shore as we sailed past. We're headed back towards Singapore and Peninsular Malaysia. We'd like to have Thanksgiving (this Thursday) with cruising friends who are now in Danga Bay Marina, Jahor Baru, just north of Singapore. This is where we left Ocelot while we came back to the USA for July and August 2010.